Not everyone shares your taste in music. Or sports. Or boats. Or recreation. Or wakes. Or engine noise. Or even beverages. Even if they do, they probably don’t want to share right now. It’s easy to get totally focused on what you’re doing, even in a shared environment. Let’s face it: when you’re cranking along at 25 knots, your attention is on making sure you don’t hit anything solid, and the exhilaration of speed on the water. You’re not looking back at your wake, and seeing how much the swimmers, paddle boarders and kayakers appreciate it. Or how much the waterfront folks enjoy watching their watercraft bang on the dock. And the people out for a quiet day fishing really want to compliment you on your speakers and how loud your motors are. They’re just as happy as you are when you’ve just nestled in to bed after a long day on the water, and someone drops anchor next to you, invites friends, fires up the generator, plugs in the blender and the music, and parties down until the crack of dawn. The long and the short of it is that you ARE in a SHARED environment. 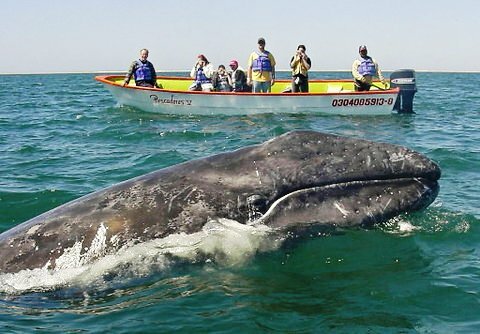 Even the gray whales in Bahia Todos Santos shy away from noisy boaters, and bass in the lakes don’t really flock to rock and roll. Respect the rights of others. Show some consideration for the people around you.When you’re at the launch ramp or the dock, be quick and make room for the next boat. Respect the private property along the shore. Make sure you have permission to go ashore, use the dock, or cross their land. And so on…. Remember, the other folks in or on the water have the same rights you do. And, just like you, all they want is a good day on the ocean, lake or river. Mike Dwight March 10, 2016 Category: General Content, Uncategorized. Tagged: gray whales, wakes.